For the past few weeks I have been receiving many comments from the user Rathony. The pattern goes like this: 1) I make a comment on someone's answer, or I post my own answer 2) Within minutes, a comment appears in my inbox from this user, 3) As soon as it appears in my notification box, it disappears and is replaced with something else or nothing at all. The comment appears long enough for me to read or see it on my Ipad. The comments have been rude and abrasive (calling me a fool or foolish among other things--although to be honest, my Exes have called me worse things), telling me I need to erase my answers, calling me biased, threatening to delete or erase or edit my answers because they are incorrect, contain grammatical mistakes, are illogical, etc. "Hey. I know you are downvoting my answers. Just dropped from 2935 to 2931? Go ahead. Keep downvoting. You know what is amazing? I am not downvoting your answer." Like everyone, I've had my fair share of down votes...but 8 in a row?! And immediately following this comment? This comment can not be called a "mistake" because it clearly references the number of points I have and the fact that they did in fact decrease because I cast two negative votes. Is this sort of behavior acceptable or normal on SE? Can people erase or delete half of my answer and fill it with what they think is correct? How is it that this person is stalking / tracking me like this? Does the system allow users to follow other users? Are my votes anonymous? I thought they were. I am not able to flag the comments because they disappear before I am able to. Since my first encounter with Rathony on November 7, I have ignored all of the "comment grenades" lobbed at me and have not responded at all...how can I when the comments instantly are deleted? 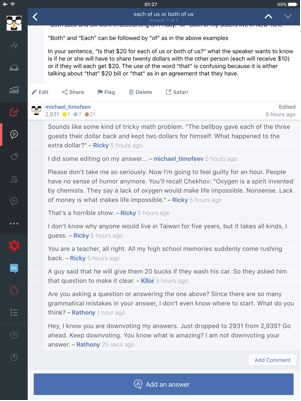 I have actually upvoted many of his comments or answers as I found them helpful or useful. Thank you for letting us knowing what is going on. We will look into the serial downvoting and that will be reversed if we confirm that it is happening. As for the comment harrassment, please flag (with "needs mod attention", and explain that it is for this question) the post/posts or one of your own comments on the posts where this has occurred and we will look into it. It's possible he's writing the comments then deleting them, but it's also possible that the comments have been flagged for removal, so they are being deleted automatically and we don't see them in the queue. In either case, it warrants investigation. It is expected that users will edit your posts for clarity or to correct grammar and other mistakes, but edits should not change the original meaning of the post. 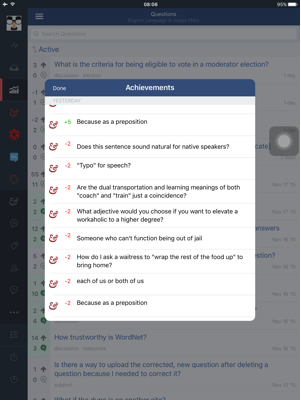 You can rollback edits if you feel that the edit has changed the meaning of your answer, but I encourage you to leave stand edits that change the structure and spelling. There is no way to "follow" users, but it is simple to click on your name to get to your profile and then from there look at your other posts. Your votes are anonymous unless you leave a comment stating how you voted. ad-hominem insults are not acceptable under the official Stack Exchange guidelines. Not the answer you're looking for? Browse other questions tagged discussion comments flagging users . Boss, why was this answer deleted?